The obvious purpose of quick hoops is freeze protection. However, I also find it useful to split up the garden into use-now and use-later areas by covering up the latter. Usually, out of sight, out of mind is a bad thing in the garden. 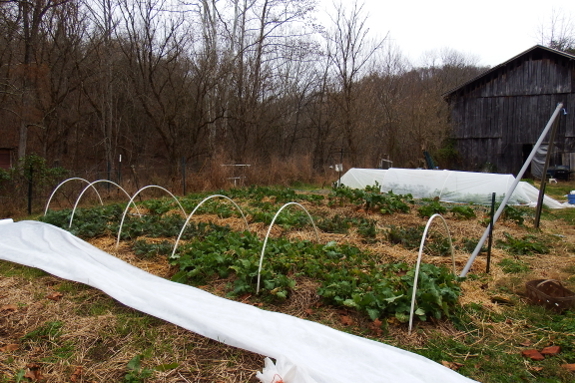 But when you're stockpiling food for year-round use, a hidden harvest waiting for you in December can be a plus. 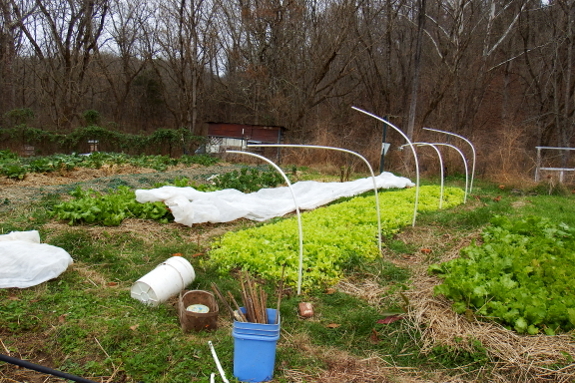 To that end, I covered 1.25 rows of kale, one row of lettuce, then about half a row of parsley and a quarter row of mustard greens Tuesday. If Mark's tri-tunnel works out, that'll sock away another row of kale and most of a row of brussels sprouts. A full winter feast! And we have roughly the same area left uncovered for November harvest. This is such a bountiful time of year. What are your hoops made from? They look like common PVC? NaYan --- Yep, they're PVC. If you missed it, you can read the full construction information in Weekend Homesteader: October.